Last week we had a friend in town, and instead of showing him our usual Guangzhou haunts, we went adventuring. We decided on a two-day trip to Yangshuo, about a 6 hour bus ride from Guangzhou. Upon our 5am arrival by bus, bleary-eyed and trying to stay somewhat dry from the rain, we headed straight to a hostel for a few more hours of rest. The next morning as we were walking around, I felt like I had been transported overnight into some magical land. 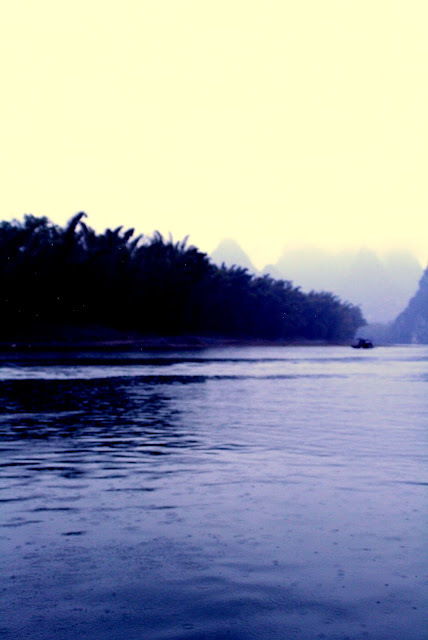 Yangshuo was considerably colder and wetter than the more coastal Guangzhou. But rather than making the town dreary, the fog created a beautiful setting for karsts to peak out of, and the rain slicked the stone walkways, the gorgeous lanscape reflecting on the tiniest surfaces.